Lizabeth Berkeley has received a grant from the Stern Foundation Perpetual Medical and Scientific Research Fund in support of the Gayle Greve Hunt School of Nursing (GGHSON) Baby Café. “We are excited to be entering our ninth year of service and thrilled that the Stern Foundation is supporting the school of nursing and mothers here in the El Paso community to succeed at breastfeeding,” says Berkeley, director of the Baby Café at Texas Tech University Health Sciences Center El Paso (TTUHSC El Paso). The Café is a free resource for pregnant women and moms living in the Paso del Norte region. The center offers education and assistance with breastfeeding in a friendly, cafe-style environment. Breastfeeding is recognized as the gold standard for nutrition and overall health in newborns. About 75 percent of all U.S. women attempt to breastfeed, but many of those moms — some 60 percent — do not reach their goals. 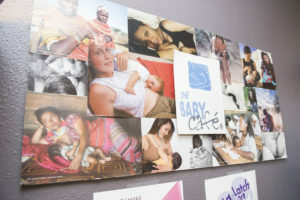 To improve these rates, specially-trained staff at the Baby Café work with women to reach their lactation goals. With the funds from the Stern Foundation, Berkeley hopes to expand the Baby Café’s services and increase the number of mothers and babies who visit. She also is interested in recruiting and training more volunteers to help run the center. When the GGHSON Baby Café opened in 2008, it was the first center of its kind in the state of Texas. So far, it has assisted more 3,000 new mothers and has had more than 12,000 visitors.